Welcome to Mill City Grows! Save the date for the Freshest Party of the Summer Season! Advance online tickets are now ON SALE! Thanks to your dedication and generosity, Mill City Grows continues to unite our diverse community through locally grown food. Our Food Access and Education Programs forge meaningful, interpersonal relationships that improve the emotional and physical well-being of Lowell residents of all ages. Our organization is rooted in the idea that when people gather to grow, cook, and share wholesome food, amazing things can happen. This work is only made possible through your collaboration, inspiration, and enduring support! Please join us as we embark on a new year of cultivating rich community connections through food! Mill City Grows Headquarters is relocating to Lowell’s historic Wannalancit Mills as of April 1, 2019! Click here to read the full press release. Mill City Grows Mobile Market is on temporary hiatus until Sunday, May 5. Due to our office relocation, our Mobile Market will NOT be present at The Farm Market at Mill No. 5 until Sunday, May 5. Be sure to follow our Mobile Market on Facebook for updates and information. We accept cash, credit, debit, and SNAP/EBT. “Toss It Up” for Mill City Grows at Warp and Weft during March and April. 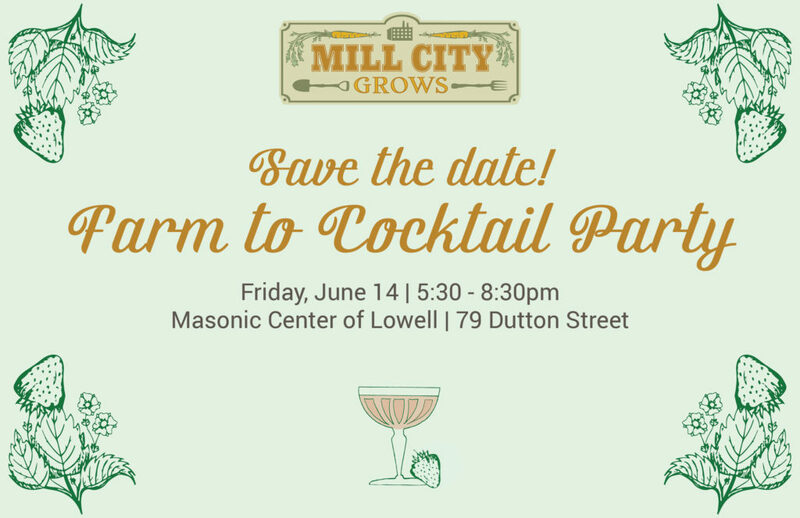 Support fresh food access while enjoying food and drink at one of Lowell’s favorite spots! Visit Warp and Weft in March and April and toss up a bill or two onto their ceiling — all cash that “sticks” to the ceiling will be donated to Mill City Grows! Join us for our special “Drag Me To Bingo” event on Tuesday, April 23, for more fun and giveaways to benefit food access in Lowell! Click here to learn more on Facebook. Mill City Grows: a social innovator. Mill City Grows was selected as one of five of Root Cause’s 2014 Social Innovators! Mill City Grows is representing the Sustainability in Our Communities: Building Greener and Healthier Cities Track. Root Cause’s Social Innovation Forum provides a unique opportunity for innovative nonprofit organizations and social enterprises to gain visibility, expand their networks, and build capacity. Thank you for your interest in our work and please let us know if you have any questions at info[at]millcitygrows[dot]org. Mill City Grows is fostering Food Justice in Lowell. We create urban food production sites and support Lowell residents with the knowledge and resources to grow their own food or purchase locally grown food!